With sustainability at the heart of everything we do at Social Pantry, we need to make recipes accessible and affordable for everyone, catering clients, dinner guests and simple dine-in dishes. Root to stem is the perfect way to reduce waste whilst still making sure the taste is spot on. Be brave and embrace the whole vegetable in this delicious whole roasted cauliflower recipe. Trim the outer cauliflower leaves and place the cauliflower in a heavy pan with salted boiling water and simmer for 5 minutes. Remove the cauliflower and pat dry. Rub the cauliflower in harissa butter and roast in the oven at 220 ̊C for 30 minutes or until nicely coloured. You want a BBQ’d effect, so a little charring is perfect! Make the dressing by mixing the garlic, tahini, lemon juice, zest and harissa paste. Season to taste. 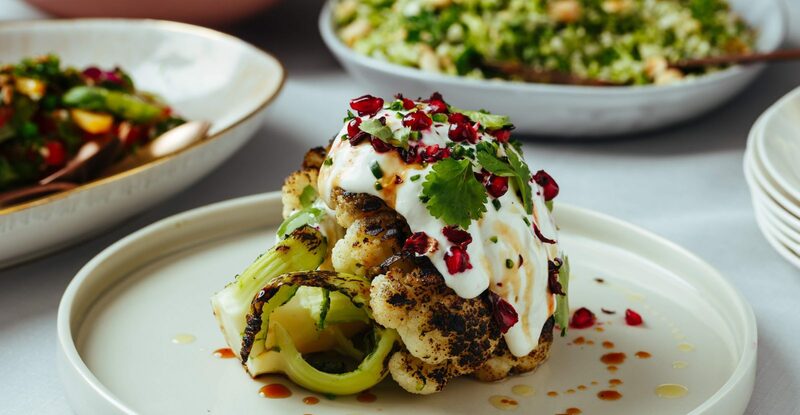 Serve the cauliflower on a sharing plate, drizzle over the dressing and sprinkle with parsley, pomegranate seeds and juice.